The following two chapters from Ferdinand Ossendowski’s Beasts, Men, and Gods  give a good sense of Baron Roman Nikolai Maximilian von Ungern-Sternberg’s qualities and vision. Ossendowski joined the baron’s army as a commanding officer of one of his self-defense troops. He also briefly became Ungern-Sternberg’s political advisor and chief of intelligence. 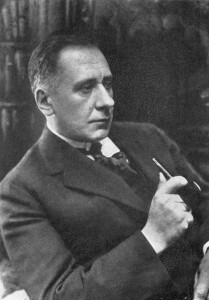 Ungern-Sternberg sent Ossendowski on a diplomatic mission to Japan and the United States, and when the baron’s regime collapsed, Ossendowski stayed on in the United States and wrote Beasts, Men, and Gods, which was published in 1922. At the entrance my eyes were struck with the sight of a pool of blood that had not yet had time to drain down into the ground—an ominous greeting that seemed to carry the very voice of one just gone before me. I knocked. “Tell me who you are! Hereabouts are many spies and agitators,” he cried out in an hysterical voice, as he fixed his eyes upon me. In one moment I perceived his appearance and psychology. A small head on wide shoulders; blonde hair in disorder; a reddish bristling moustache; a skinny, exhausted face, like those on the old Byzantine ikons. Then everything else faded from view save a big, protruding forehead overhanging steely sharp eyes. These eyes were fixed upon me like those of an animal from a cave. My observations lasted for but a flash but I understood that before me was a very dangerous man ready for an instant spring into irrevocable action. Though the danger was evident, I felt the deepest offence. At these words of mine he swung his feet down off the bed and with evident astonishment began to survey me, holding his breath and pulling still at his moustache. Retaining my exterior calmness, I began to glance indifferently around the yurta, and only then I noticed General Rezukhin. I bowed to him and received his silent acknowledgment. After that I swung my glance back to the Baron, who sat with bowed head and closed eyes, from time to time rubbing his brow and mumbling to himself. I swung round and saw Captain Veseloffsky with his white, cold face. I had not heard him enter. He did a formal “about face” and passed out of the door. The Baron stood thinking for some time and then began to speak in jumbled, unfinished phrases. I explained how my friend and I had escaped from Soviet Russia in the effort to reach our native land and how a group of Polish soldiers had joined us in the hope of getting back to Poland; and I asked that help be given us to reach the nearest port. Taking my leave, I went out of the yurta. On arriving at my quarters, I found Colonel Kazagrandi in great anxiety walking up and down my room. “Thanks be to God!” he exclaimed and crossed himself. His joy was very touching but at the same time I thought that the Colonel could have taken much more active measures for the salvation of his guest, if he had been so minded. The agitation of this day had tired me and made me feel years older. When I looked in the mirror I was certain there were more white hairs on my head. At night I could not sleep for the flashing thoughts of the young, fine face of Colonel Philipoff, the pool of blood, the cold eyes of Captain Veseloffsky, the sound of Baron Ungern’s voice with its tones of despair and woe, until finally I sank into a heavy stupor. I was awakened by Baron Ungern who came to ask pardon that he could not take me in his motor car, because he was obliged to take Daichin Van with him. But he informed me that he had left instructions to give me his own white camel and two Cossacks as servants. I had no time to thank him before he rushed out of my room. Sleep then entirely deserted me, so I dressed and began smoking pipe after pipe of tobacco, as I thought: “How much easier to fight the Bolsheviki on the swamps of Seybi and to cross the snowy peaks of Ulan Taiga, where the bad demons kill all the travelers they can! There everything was simple and comprehensible, but here it is all a mad nightmare, a dark and foreboding storm!” I felt some tragedy, some horror in every movement of Baron Ungern, behind whom paced this silent, white-faced Veseloffsky and Death. “Tell me about yourself and your trip,” he [Ungern-Sternberg] urged. In response I related all that I thought would interest him and he appeared quite excited over my tale. He shut his eyes, smoking as he spoke, and tumbling out his sentences without finishing them as though some one would prevent him from phrasing them. “The family of Ungern von Sternberg is an old family, a mixture of Germans with Hungarians—Huns from the time of Attila. My warlike ancestors took part in all the European struggles. They participated in the Crusades and one Ungern was killed under the walls of Jerusalem, fighting under Richard Coeur de Lion. Even the tragic Crusade of the Children was marked by the death of Ralph Ungern, eleven years old. When the boldest warriors of the country were despatched to the eastern border of the German Empire against the Slavs in the twelfth century, my ancestor Arthur was among them, Baron Halsa Ungern Sternberg. Here these border knights formed the order of Monk Knights or Teutons, which with fire and sword spread Christianity among the pagan Lithuanians, Esthonians, Latvians and Slavs. Since then the Teuton Order of Knights has always had among its members representatives of our family. When the Teuton Order perished in the Grunwald under the swords of the Polish and Lithuanian troops, two Barons Ungern von Sternberg were killed there. Our family was warlike and given to mysticism and asceticism. “During the sixteenth and seventeenth centuries several Barons von Ungern had their castles in the lands of Latvia and Esthonia. Many legends and tales lived after them. Heinrich Ungern von Sternberg, called ‘Ax,’ was a wandering knight. The tournaments of France, England, Spain and Italy knew his name and lance, which filled the hearts of his opponents with fear. He fell at Cadiz ‘neath the sword of a knight who cleft both his helmet and his skull. Baron Ralph Ungern was a brigand knight between Riga and Reval. Baron Peter Ungern had his castle on the island of Dago in the Baltic Sea, where as a privateer he ruled the merchantmen of his day. He fell into silence and began drinking cup after cup of tea as strong and black as coffee. The door of the yurta suddenly swung open and an adjutant snapped into a position of attention and salute. “Why do you enter a room by force?” the General exclaimed in anger. The Baron arose. His eyes sparkled and his face contracted with spasms. “Bring them in front of my yurta!” he ordered. All was forgotten—the inspired speech, the penetrating voice—all were sunk in the austere order of the severe commander. The Baron put on his cap, caught up the bamboo tashur which he always carried with him and rushed from the yurta. I followed him out. There in front of the yurta stood six Red soldiers surrounded by the Cossacks. The Baron stopped and glared sharply at them for several minutes. In his face one could see the strong play of his thoughts. Afterwards he turned away from them, sat down on the doorstep of the Chinese house and for a long time was buried in thought. Then he rose, walked over to them and, with an evident show of decisiveness in his movements, touched all the prisoners on the shoulder with his tashur and said: “You to the left and you to the right!” as he divided the squad into two sections, four on the right and two on the left. “Just so, Your Excellency!” cried the frightened soldiers. He turned and entered the yurta. After this our conversation did not flow readily and so I left the Baron to himself. After dinner in the Russian firm where I was staying some of Ungern’s officers came in. We were chatting animatedly when suddenly we heard the horn of an automobile, which instantly threw the officers into silence. “The General is passing somewhere near,” one of them remarked in a strangely altered voice. Donning my coat, I followed my established custom and slipped my revolver into it, at which the Baron laughed. We went out to the gate where the big Fiat stood with its intruding great lights. The chauffeur officer sat at the wheel like a statue and remained at salute all the time we were entering and seating ourselves. “To the wireless station!” commanded the Baron. We veritably leapt forward. The city swarmed, as earlier, with the Oriental throng, but its appearance now was even more strange and miraculous. In among the noisy crowd Mongol, Buriat and Tibetan riders threaded swiftly; caravans of camels solemnly raised their heads as we passed; the wooden wheels of the Mongol carts screamed in pain; and all was illumined by splendid great arc lights from the electric station which Baron Ungern had ordered erected immediately after the capture of Urga, together with a telephone system and wireless station. He also ordered his men to clean and disinfect the city which had probably not felt the broom since the days of Jenghiz Khan. He arranged an auto-bus traffic between different parts of the city; built bridges over the Tola and Orkhon; published a newspaper; arranged a veterinary laboratory and hospitals; re-opened the schools; protected commerce, mercilessly hanging Russian and Mongolian soldiers for pillaging Chinese firms. Soon we were out on the plain with the car going like an arrow, with the wind whistling and tossing the folds of our coats and caps. But Baron Ungern, sitting with closed eyes, repeated: “Faster! Faster!” For a long time we were both silent. “And yesterday I beat my adjutant for rushing into my yurta and interrupting my story,” he said. “You can finish it now,” I answered. “The wireless, Excellency!” reported the chauffeur. “Turn in there!” ordered the General. Once more we rushed away, sinking into the darkness of night. It was a wild ride. The car bounded over small stones and ditches, even taking narrow streamlets, as the skilled chauffeur only seemed to guide it round the larger rocks. On the plain, as we sped by, I noticed several times small bright flashes of fire which lasted but for a second and then were extinguished. “The eyes of wolves,” smiled my companion. “We have fed them to satiety from the flesh of ourselves and our enemies!” he quietly interpolated, as he turned to continue his confession of faith. The car pulled up with a jerk. The General jumped out and called me to follow. We started walking over the prairie and the Baron kept bending down all the time as though he were looking for something on the ground. Anew the motor car was rushing along, sweeping a great circle on the prairie, and anew Baron Ungern with his sharp, nervous voice carried his thoughts round the whole circumference of Asian life. “But some of my associates in the movement do not like me because of my atrocities and severity,” he remarked in a sad voice. “They cannot understand as yet that we are not fighting a political party but a sect of murderers of all contemporary spiritual culture. Why do the Italians execute the ‘Black Hand’ gang? Why are the Americans electrocuting anarchistic bomb throwers? and I am not allowed to rid the world of those who would kill the soul of the people? I, a Teuton, descendant of crusaders and privateers, I recognize only death for murderers! . . . Return!” he commanded the chauffeur.